If Goldilocks were talking about California Highway 101, she might start like this, looking at I-5: "This one is too busy, and it's s-o-o boring." Looking at the coastal route on Highway One, she might continue: "This one is too long and - oh my! I might get carsick." She would end by saying: "Highway 101 is just right." In fact, 101 is a good alternative to the busy interstate — and it takes less time than the coastal route. You can see the ocean, but you also get a look at some fascinating inland areas and drive through a variety of landscapes. The total distance from Los Angeles to San Francisco on 101 is about 420 miles. You could spend a week on the trip if you make every stop and follow every interesting side road, but you can do it in much less time. When you're planning, think about how much daylight you'll have. If you're going on a road trip, you probably want to see the sights, not zip past them in the dark. In the summer, you will have more than 14 hours of daylight, but in December, it's only about 9.5 hours. If you only have one day: It's easy enough to make this drive in a day if you don't dawdle. I've done it plenty of times. It takes a little longer than I-5 but it's more interesting and less hectic. Your GPS may say the trip takes 7 hours, but that's with no stops, a superhuman feat that you probably don't want to attempt. Allow about 9 hours for a couple of stops to stretch your legs, eat and take care of other primary needs. When you get to the two ways to get from Santa Barbara to San Luis Obispo, take the inland route. It's actually shorter than following the coast. Plan on either getting a quick meal or taking along a picnic or snacks to eat while you drive. Bob's Well Bread at 550 Bell Street in the town of Los Alamos is a great place to get a quick meal or something for the road. If you can take two days: Stop for lunch in Santa Barbara. Spend the night in Pismo Beach for a fun, California beach town experience or stop in Paso Robles, which is known for its local wine and food. Grab some picnic supplies or road snacks and make the drive to San Francisco on the second day. If you have three days: You can make an even more leisurely journey. Have lunch, spend the afternoon and stay overnight in Santa Barbara. Take a detour into Solvang and continue to the tiny town of Los Olivos. Spend the night in Pismo Beach or Paso Robles. Finish your trip to San Francisco, taking a small detour to San Juan Bautista or making a stop at San Miguel to see the old mission. This guide says you'll be taking Highway 101 from LA to San Francisco, but this is a road trip, and the first thing you need to do is throw caution out the window because the first thing you're going to do is take a different highway. Then silence your GPS device before it drives you nuts, trying to take you on a different — and boring — route. Highway 101 from LA to Oxnard is one of the least scenic drives in Southern California, and that's the last thing you want when you're starting your road trip adventure. Instead, go north from Santa Monica through Malibu toward Oxnard. From there, you'll catch 101. Get started early. This guide starts your trip in Santa Monica, but you have to get there from wherever you are and the earlier you get going, the less traffic you'll have to endure. Before you get started, check the traffic for slowdowns and delays. You can use your favorite smartphone app, listen to KNX radio at 1070 AM — or call the CalTrans highway conditions hotline at 800-427-ROAD. This route follows CA Hwy 1 along the continent's edge through Malibu, with lots of great views. I love the Malibu coast drive, zipping along the edge of North America through one of California's most famous towns and then between mountains and ocean. Most of the time, traveling northbound on Hwy 1 will be easy. If you get a late morning start on a summer weekend, you may find the roads packed, with long delays to get through the traffic lights between Santa Monica and Malibu. If you plan to use this route, get directions to Malibu from your starting point. From Malibu north, avoid taking the slow drive through Oxnard by choosing Ventura as your next destination. You'll find more details and side trips in online guides to Malibu on Highway One. Santa Monica: You won't have to explore Santa Monica if you're going to make it to San Francisco the same day you leave LA. Driving through, you will see the Santa Monica Pier and beach. Traditionally, the pier is the official end of Historic Route 66. Town of Malibu: The reality of Malibu is less exciting than the legend. As you drive through town, you'll pass several miles of garage doors, fences and hedges between the road and the ocean. After that, the roadside scenery gives way to driveways and landscaping. North of Pepperdine University, the views open up. Pepperdine University: I always wonder how students get any studying done on a campus with such a view like this one has. Pepperdine is a private university run by the Church of Christ. It was built in the 1960s and occupies more than 800 acres. Side Trip the M*A*S*H TV Set and a Temple (1 to 2 hours): Take Malibu Canyon Road and Las Virgenes east for a side trip to see the beautiful Hindu Venkateswara Temple (1600 Las Virgenes). It's open to everyone as long as you're respectful, dress modestly (no shorts or tank tops) and remove your shoes and hat. Fans of the television program can continue on Las Virgenes to Malibu Creek State Park, (4 miles from 101) where the show's opening and many of its outdoor scenes were filmed. From there, you can continue east to join US Hwy 101. Paradise Cove: With a restaurant and a pretty stretch of sand that seems quintessentially Southern California, Paradise Cove is a fun stop. There's a parking fee, but if you eat a meal there, it's much lower. And if you loved The Rockford Files, you'll recognize the beachfront location of Jim Rockford's mobile home. More Beaches: On your way north, you'll pass Zuma Beach. It's a wide-open stretch of beautiful sand and surf and a nice place to hop out of the car and wiggle your toes in the sand. There's a fee to park in the lot, but you can do what the locals do - just park beside the road and walk in. Point Mugu: The big rock at Point Mugu may look familiar: it's been in film shoots and television commercials. A little further north, you may catch a glimpse of the Naval Air Station. Past the Naval Air Station, the road curves right (east) and the freeway ends. You'll see a sign pointing toward Hwy 101. Follow Rice Ave straight until you get to 101 and then go north, going from Oxnard to Santa Barbara. If you saw the news coverage of the late 2017 Thomas Fire and the early 2018 mudslides near Montecito, you could easily conclude that there’s nothing left to see from Ventura to Santa Barbara. Despite those sensation news clips, most of US Highway 101 and all of the area’s most popular tourist attractions were untouched. Traveling between Ventura and Santa Barbara on Highway 101, you might see some scorched hillsides and blackened trees, but if you’re driving on a clear day you’re likely to be too busy staring at the ocean and the Channel Islands offshore to notice. And the highway department did such a good job of cleaning up the mud that you’d scarcely know that it ever flowed across the highway. Northbound traffic can come to a standstill north of Santa Barbara on Friday evenings and at the beginning of long weekends. Time-saving detours aren't possible and the only way to avoid all of it is to find another time to make the drive. Santa Barbara rush hour starts mid-afternoon on weekdays and traffic backs up in both directions between the north edge of town and Carpinteria. Rather than sit in a jam, use your map, GPS or smartphone to find an alternate route through town. 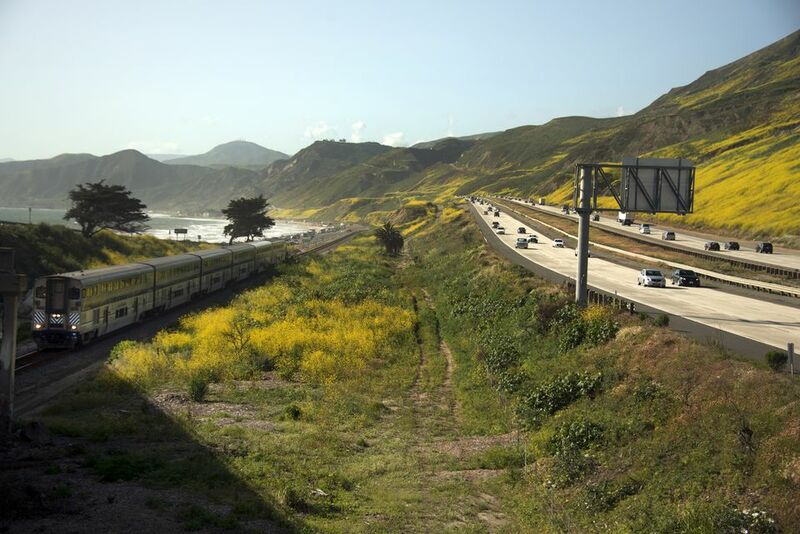 You'll find a few places to stop along the highway for food and gasoline in Ventura, but north of there, the highway is literally wedged between cliffs and ocean in places, with the next gas stations just south of Santa Barbara. Strawberry Fields: Strawberries grown in this part of California are among the state's best, in the opinion of this strawberry lover. Strawberry season starts as early as February and can last through September. You'll find produce stands selling them at many exits along the way. You'll also pass the fields where they're grown. Notice how they're planted, in mounded rows covered with plastic. Harvesting is done by hand, and you'll often see workers bent over picking faster than you can imagine. Amazingly efficient, 65 to 70 pickers can harvest 1,000,000 plants. Channel Islands: Past Ventura, the highway runs close to the ocean. On a clear day, you can see the Channel Islands, just a few miles offshore. Never part of the mainland, the five islands have unique geography, character and unique plants and animals. They're fascinating to visit, but a long boat ride away that will add a full day to your trip. Citrus Groves: On the inland side of the highway, you'll see some citrus orchards. The fruit usually ripens in the winter and the trees bloom in very early spring. Man-made Island and Pier: The structure jutting into the ocean toward a tiny island at Mussel Shoals is the Richfield Pier, which connects Rincon Island to the mainland. The human-made island was built in 1958 for oil and gas production. La Conchita: Look closely as you pass this tiny community and you can see banana trees growing in backyards and along the streets. They're remnants of a former banana plantation. After a freeze killed the bananas, they were replaced with avocados. Rincon Beach: Where the coastline veers away from the highway is a favorite spot for local surfers. It's a nice place to stretch your legs and watch them (exit at Bates Rd, exit #83). Santa Claus Lane: The kids - and adults who occasionally let their inner child go wild - might get all excited when they see an exit that claims to take them to Santa Claus. Unfortunately, you won't find the jolly old fellow exit #89. The street name is left over from a 1950s tourist attraction that closed many years ago. Santa Barbara Polo and Racquet Club is on the inland side of the road south of town. It's the third-oldest polo field in the United States. Santa Barbara: Mediterranean-style architecture and red-tiled roofs have earned Santa Barbara the nickname "American Riviera." Its east/west-oriented coastline creates a moderate climate that's exceptionally nice, even for sunny southern California. Detour Through Santa Barbara: By the time you get into Santa Barbara, the highway will be inland far enough that you'll only get glimpses of the water - and you'll see little of the town itself. For a quick look without stopping, follow this route: Take Exit #94C (a left exit) onto East Cabrillo Blvd., turn left at the end of the off ramp and follow it along the waterfront. At Castillo Street, turn right to rejoin 101 North. Other Santa Barbara Exits: Milpas Street north will (exit #96A) takes you to La Super Rica (622 N Milpas St), an authentic taco stand where the tortillas are handmade seconds before they're cooked and weekend diners cheerfully wait in lines that can extend down the block. If you want to go to "downtown" Santa Barbara, take exit #96B for Laguna Street/Garden Street and then to State Street. Hwy 154 Exit: North of town, you have two options to get to San Luis Obispo, which are outlined on the next page. The obvious thing to do north of Santa Barbara is to stay on Highway 101. If you're a purist who wants to drive on 101 - and only 101 - that's the thing to do. If you'd like to get a look at a different California landscape, you can also take the inland route. As a bonus, it's also slightly shorter. You can skip straight to the route you're most interested in by clicking on its link, or just click next to check them all out in detail. The scenery north of Santa Barbara is much like it was south of town, with the Channel Islands offshore. Eventually, the road turns inland and passes the towns of Buellton and Solvang. This is the route to use if you are towing a big trailer, to avoid the curves and steep grades on Hwy 154. This route is a great way to go in daylight, especially on a sunny day. If it's after dark when you can't see the scenery, it's not a good choice. Hwy 154 goes through a small mountain pass, across a historic bridge and then descends toward a blue lake set against white mountains. North of that is some of California's best horse country, with picture-perfect farms and white wooden fences. The two routes converge north of Los Olivos, where CA Hwy 154 intersects 101. Continue on 101 to San Luis Obispo. North of Santa Barbara, you'll get your last glimpses of the Pacific Ocean before the road turns inland for a long stretch. Avocado Orchards: North of town, those untidy-looking orchards on the inland side of the road are growing avocado trees. The unlikely looking trees are evergreen and produce fruit only every other year. Highway 101 veers northward a little west of Santa Barbara, away from the ocean and over the Gaviota Pass. Rest Stop: At Gaviota Pass, you'll find the first of two state-run rest stops between Los Angeles and San Francisco on US Hwy 101, but don't fret if you miss it. You're only 10 minutes from the next town. Side Trip to Old California (2 hours): Mission La Purisima, one of California's best preserved Spanish missions is about 18 miles west of US 101 on CA Hwy 246 (exit #140A). I like it for the undeveloped surroundings, and kids love the animals they keep in the corrals. To decide if you want to go, check the Guide to Mission La Purisima. Buellton: Fans of the film Sideways may recognize the Hitching Post restaurant (also at exit #140A, 406 E. Highway 246), but it was popular for its barbecue, steaks, and French fries long before the film crews arrived. Buellton is also home to Pea Soup Anderson's. You've seen their mascots Hap Pea and Pea Wee on billboards for miles, splitting peas for their soup one by one. It's a place some people love, but one that I'd skip. Side Trip to Little Denmark (1 to 2 hours): The little Danish town of Solvang is a few miles east of 101, also at exit #140A. You'll find some nice shopping and good places to eat, including a few bakeries and other spots serving Danish cuisine. Get more out of your trip by exploring Danish cuisine using the guide. On the way into town, you'll pass an ostrich ranch, where you can pay to go behind their fence (or just look at them from the road) - or buy ostrich eggs and other products in their shop. Vineyards: Between Buellton and Pismo Beach, US Hwy 101 passes through a pretty, hilly area where you'll see California live oak trees growing on the hillsides. That is, where they haven't been cut down to plant grapes. When you reach the CA Hwy 154/ US Hwy 101 intersection, this route merges with the inland option going north from Santa Barbara. Continue on 101 to San Luis Obispo on page 7. During daylight hours, you can save about 15 miles and enjoy one of California's prettiest drives at the same time. It's my favorite way to travel through this area on a sunny day. At night, when you can't see the scenery, you'll be better off to stay on 101. After climbing through the San Marcos Pass on 154, you'll pass through a broad valley filled with horse ranches and drive beside a beautiful, blue lake set against a backdrop of white hills. CA Hwy 154 is a two-lane road with occasional passing sections where they're needed. To get on it, set your GPS to go to Los Olivos and take exit #101B north of Santa Barbara (labeled State St/Cachuma Lake/San Marcos Pass). Cold Spring Tavern: I always wonder what characters stopped at this place when it was a stagecoach stop in the late 1800s. Today, it attracts a broad range of people, and everyone seems to enjoy its rustic charm. It's at 5995 Stagecoach Road and a fun place for a meal. The exit is easy to miss - take if from someone who's made a U-turn more than once after doing just that. Read the directions on their website. Cold Spring Canyon Arch Bridge: It's hard to get a good look at the bridge as you're driving over it, but it's pretty impressive. The fifth longest bridge of its kind in the world at 1,217 feet, it was built in 1963 as part of a project that eliminated 88 curves on Hwy 154. Lake Cachuma: A human-made lake that gets its name form a Chumash Indian word, its blue water is a lovely contrast to the nearby white-colored hills. Horse Ranches: The Santa Ynez Valley may well be the top horse location in California, with more than 50 breeds of horses raised in the area and 20 veterinarians to take care of them. Detour to Solvang: If you want to visit the Danish town of Solvang, turn at the traffic circle onto CA Hwy 246. From there, you can get onto Hwy 101. Los Olivos: It's tiny, tidy and cute. In fact, it's so cute that it stood in for the fictional town of Mayberry in the 1986 television movie Return to Mayberry, a follow up from the old Andy Griffith Show. Los Olivos is a good place to stop for a bit to eat. Stopping in too many of their winery tasting rooms may not be such a good idea, though. You still have a long drive to get to San Francisco. To get into town, turn left at Grand Avenue west. About 2 miles north of Los Olivos, Hwy 154 ends at US Hwy 101. Your next major destination is San Luis Obispo. No matter which of the routes you took from Santa Barbara to the intersection of US Hwy 101 and CA Hwy 154, this guide will take you the rest of the way to San Luis Obispo. North of Santa Barbara, sections of Highway 101 are not a freeway (which drivers access using on/off ramps) but an expressway. Side road traffic may cross your path and cars may pull into traffic from side roads and driveways. In those areas, it's a good idea to pay a little more attention to cross traffic. How to tell the difference? Signs usually mark the end of "freeway" sections, but there are other clues. If it has on and off ramps, it's a freeway. A quick detour through the town of Los Alamos is well worth your time, for a stop at Bob's Well Bread Bakery. From coffee and pastry through breakfast items to sandwiches, their offerings never disappoint. Santa Maria Tri Tip: California's traditional style of barbecue is best in the town of Santa Maria. The meat is seasoned simply with salt, pepper, and garlic then roasted over a live oak wood fire. Use Yelp, your favorite food-finding app or just go retro and ask a local for the best spot in town. Raspberries: North of Santa Maria, those structures that look like oversized, white worms crawling up the hillsides are called "high tunnels." Using them to grow raspberries extends the growing season and improves profits. Pismo Beach: Pismo Beach is the quintessential California beach town, well worth a few minutes' stop. For a quick trip through town, take exit #190 (Price Street) and turn left on Pomeroy Avenue toward the pier. Get a cup of the best clam chowder in town at the Splash Cafe (197 Pomeroy Avenue) or an order of fish and chips at Brad's (209 Pomeroy Avenue). If you have a little more time, take a walk on the beach and out onto the pier, or drive around to Oceano Dunes, the only beach in California where you can drive your car right out onto the sand. To get out of town, follow Pacific Coast and look for signs to Hwy 1/101 north. Don't think you got lost - this route takes you north for a couple of miles and under the highway before you get back on it. After passing close to the ocean for a few miles, Hwy 101 leaves the coast. Say bye-bye as it passes out of sight. Between there and San Francisco, the highway runs inland. Madonna Inn: It's the only hotel that I'm mentioning in this guide. One of California's quirkiest places to stay, every one of its 109 rooms is decorated in a unique style. It's not for everyone, but some people enjoy it. Take exit #201 (Hwy 227) onto Madonna Road. At San Luis Obispo, you can switch to CA Hwy 1 (exit #203B) and take the coastal route to San Francisco. The difference in distance between the two routes is small, only about 20 miles. But don't let that fool you. Taking Hwy 1 will take at least 2 hours longer than 101. That assumes that you can resist stopping along one of the world's most beautiful drives. To be more realistic, allow at least 4 hours from San Luis Obispo if you choose to travel on Hwy 1. On Sunday afternoons and the last day of long weekends, traffic jams often develop at the intersection of Highway 156 West in Prunedale. If you check traffic before you pass Salinas, you will have more options for bypassing it. However, a better option is to try to time your trip, so you get through that spot before mid afternoon. The drive north from San Luis Obispo through Paso Robles passes through agricultural and wine-growing areas, dotted with small towns. Cuesta Pass: About 11 miles north of San Luis Obispo, the road climbs for 2 miles up the Cuesta Grade to 1,522 feet (464 m) above sea level before dropping back down into the next valley. Side Trip to the San Andreas Fault (4 hours): It's hard to believe that a landscape like the Carrizo Plain is so close to Hwy 101. The San Andreas Fault runs through the middle of it, the Pacific Flyway (bird migration route) passes over it and in the spring, its wildflowers can be quite spectacular. Take exit #211 (Hwy 58) through Santa Margarita to get there. Detour to Hearst Castle (3 to 4 hours): Take exit #228 onto CA Hwy 46 west to visit Hearst Castle. Tours fill up during busy seasons, and an advance reservation is a good way to be sure you don't waste the drive. From there, you can return to 101 or go coastal using the Guide to CA Hwy 1. Paso Robles: Take exit #229 at Spring Street to get to downtown Paso, the center of California's fastest-growing and most exciting wine region. This is a great place to stop overnight if you're making this drive in more than one day. It's also a good place to stop for a meal or stretch your legs on a walk around the tree-shaded town square. For services and fast food, use exit # 231B (Hwy 46) - or the next state rest stop is just 14 miles north. What are those bells? You'll see metal bells hanging from poles every few miles between LA and San Francisco. It's enough to make you think Californians are a bunch of "ding-dongs," but they actually mark the old Spanish El Camino Real (The King's Road). They were first installed in the early 20th century. According to Los Angeles public television station KCET, the “King’s Road” wasn’t a reality but a romantic notion fueled by the 1884 publication of Helen Hunt Jackson’s book “Ramona." San Miguel (exit 239A): The most interesting thing in this tiny town is the old Spanish era Mission San Miguel. Built in 1818, it's one of the best preserved missions in the state, with its original frescoes still intact. A quick visit will take an hour or less. There are no services between San Miguel and King City, which is about 43 miles away. Camp Roberts: This camp is an Army National Guard base, used for training by the U.S. National Guard and occasionally by the British Army. Rest Stop: The rest stop 2 miles north of Camp Roberts is the second of two state-run stops on US Hwy 101 between San Francisco and Los Angeles. The next place for restrooms is King City, about 36 miles north. Side Trip Back in Time (1 hour): When I first discovered the Valley of the Oaks, I couldn't believe it. Tucked away off the highway is an area little changed since Europeans first set foot in this part of California in the 1700s. Take a side trip to visit Mission San Antonio de Padua (check ahead to be sure it will be open) and William Randolph Hearst's Hacienda ranch house, which is now a hotel. To get there, take exit #252 at highway G18/Jolon Road. Then take Mission Road toward Fort Hunter Liggett. When you leave, continue on Jolon Road and you'll rejoin 101 just north of King City. San Ardo Oil Field: This clutter of oil wells, pumpers and equipment a few miles south of the town of San Ardo is at the same time unsightly and fascinating. According to Aera Energy, it produces approximately 7,000 barrels of heavy crude oil per day which is transported to Los Angeles refineries. Open Spaces: The next few miles are the most sparsely populated section of the drive. Much of it is government land. The Salinas Valley starts here and you'll be driving through it for the next 90 miles. In recent years, vineyards are taking over the rolling hills, some of the vines that make Monterey County the state's largest wine grape producer. Old Woman of the Mountain: As you approach King City, you'll see a supersized painting of a woman with orange California poppy flowers. Created by local artist John Cerney, it's his vision of a Mother Earth figure. You'll see more of his work further north. King City: You'll find a few fast food joints here - and a handful of acceptable motels, if you need to break your journey. The towns of Gonzales and Soledad a little further north also have gas stations, lodging and places to eat. Those overgrown windmills you see along the highway here are made to generate electricity. If you travel through the area on a hot summer afternoon, you'll see them in full action. Side Trip to The Pinnacles (2 hours or more): Take exit #302 at CA Hwy 146 east near Soledad to reach the west side of Pinnacles National Park, which is 14 miles from the highway. The Pinnacles were formed almost 200 miles south of here and have moved north along the San Andreas Fault to reach their current position. The hiking trails there are lined with wildflowers in spring. It's also home to a large flock of California Condors, which you may see soaring overhead. Salad Bowl of the World: Between King City and Salinas is one of the country's most productive agricultural regions, producing over $3 billion worth of lettuce, artichokes, broccoli and other green crops annually. The drive through this fertile valley passes garnet-and-lime-colored lettuce fields, vineyards and a wide range of other growing things, extending from the Gabilan Mountains (on your right) to the Santa Lucias on the west. Don't be surprised if you smell some of those crops, especially just after the broccoli, cabbage and cauliflower harvest. Bracero Highway: You may have seen several "memorial highway" markers along your route. Most of them are dedicated to California Highway Patrol officers killed in line of duty, but this one is different. It celebrates Mexican field workers and railroad builders. Salinas: Author John Steinbeck called this area the "Long Valley” and made it the backdrop for many of his famous stories. The most popular tourist attraction is the National Steinbeck Center, with exhibits about the author's life and also about the area's agricultural heritage. Steinbeck's birthplace and childhood home is also open to the public and just two blocks away. Detour to Monterey and Carmel: From Salinas, you can take exit #326C onto CA Hwy 68 toward the coast and the Monterey Peninsula. From there, you could continue to San Francisco on CA Hwy 1 using the guide to driving on Highway 1 - or take Hwy 1 north to CA Hwy 156 at Castroville and rejoin Hwy 101. Baseball Game: Past San Juan Road, you'll see another John Cerney mural on the right - a baseball scene painted on a barn, with cutout players scattered among the livestock. Side Trip to San Juan Bautista (1 Hour): Take exit #345 onto CA Hwy 156 East for a side trip into the past. San Juan Bautista is home to a mostly intact Spanish mission facing a state historic park that preserves the center of the early California town. The town's single main street is lined with shops and places to eat, making it an enjoyable diversion. Farm Stands: When you get close to Gilroy, you'll find produce stands selling cherries in the summer,. A little further north a few roadside stands that trade on Gilroy's title as Garlic Capitol, selling garlic-related products of all kinds. Rapazzini Winery produces Chateau de Garlic, a garlic-laced vintage that might make an unusual gift for the folks back home. Garlic: Don't be surprised if you smell garlic as you travel north. The Gilroy Foods processing plant often fills the air with the odor. In fact, it sometimes drifts all the way up to San Jose, nearly 30 miles away. Gilroy Outlet Shopping: Take exit #357 at CA Hwy 152 West/Leavesley Road for Gilroy Premium Outlets, a large complex with more than 100 stores. Highway Patrol: There's California Highway Patrol office just off the highway between Gilroy and Morgan Hill. Expect more black-and-white patrol cars along this section of highway than in other areas. On to San Jose: The highway passes some small farms, the town of Morgan Hill and the Coyote Valley on its way to San Jose. To get from San Jose to San Francisco, you have two options. Each has a different feel, and you'll see very different kinds of things along the way. Both are interesting. You can skip straight to the route you're most interested in by clicking on its link, or just click next to check them out in detail. This route might best be called the Urban Route, going right through the heart of Silicon Valley. It passes some high-tech headquarters, a couple of interesting aerospace facilities, keeping just far enough away from the shores of San Francisco Bay that you'll only catch a glimpse of it. This is the direct route to San Jose International Airport and also to San Francisco International. Far more scenic than 101 and sometimes called the world's most beautiful freeway, I-280 parallels the San Andreas Fault, passing through beautiful, wooded hills. You can also get to San Francisco airport on I-280, by taking a short drive east on I-380. In late afternoon commute hours, northbound traffic on I-280 can get slow. To give you an idea of the most congested times, San Jose carpool lane hours are from 5 to 9 a.m. and 3 to 7 p.m., Monday through Friday. If this is the route you want to take, this is your last page - or click next to read about using Highway 101 all the way to San Francisco. After you pass the CA Hwy 85 interchange, I-280 is a very scenic highway that has earned the nickname "World's Most Beautiful Freeway." In fact, it may be hard to believe that you're driving through the heart of an urban area between two of the country's biggest cities. Getting Started: Take exit #384 from US 101 north onto I-280 north. Downtown San Jose: San Jose is the #10 city in the US by population, with about 1 million residents - 20% more than San Francisco. The most visible high-tech company downtown is Adobe Systems. Side Trip to Winchester Mystery House (2 hours): Sarah Winchester built this rambling, 160-room, unfinished and now unfurnished house starting in 1884. She kept workers busy 24 hours a day, 7 days a week for the next 38 years. It's a curiosity to be sure and they offer daily tours. Find out more in the Winchester Mystery House Visitor Guide. It's at 525 South Winchester Blvd. Apple Headquarters: Just off 280 at De Anza (exit 11) is the headquarters of Apple Inc. That is, until they finish their new mega-headquarters not far away. The address is 1 Infinite Loop. There's not a lot to see from the outside and they don't allow casual visitors. A small but interesting piece of trivia: Apple's map icon shows the 280 highway marker and a small section of directions to this location. Asian Building: A lot of people wonder what that Asian-styled building is overlooking the freeway about a mile north of the Foothill Boulevard exit. Even many locals don't know that it's called Maryknoll. Built as a seminary in 1926, it's now a retirement home for Fathers and Brothers of the Maryknoll religious order. Big Antenna: The big, mesh dish antenna sitting on top of that hill is often called just "The Dish." It's a 150-foot-diameter (46 m) radio antenna built in 1966. It's used to communicate with spacecraft and for radio astronomy measurements. If you see it pointing straight up, it's off duty. SLAC: The Stanford Linear Accelerator is used for research in elementary particle physics using electron beams, which are generated by accelerating tiny electrons along a long, linear path. The accelerator itself is under ground, but the freeway passes over the above ground support structure just before you get to the Sand Hill Road exit. Side Trip to Palo Alto and Stanford University: If you want to take a quick tour of the famous university, ignore the signs at Page Mill Road and instead use exit #24 onto Sandhill Road, then turn right onto Arboretum Road and right again on Palm Drive. San Andreas Fault: You can't really see it from the highway, but you might be interested to know that I-280 parallels the fault as it travels north. Closer to San Francisco, the fault veers offshore and under the ocean. "Flintstones" House: Shortly after you pass the exit for CA Hwy 92, you'll see an unusual home on the right. To me, it looks like it came right out of the Town of Bedrock. Built in 1976 and designed by William Nicholson, it was formed over inflated aeronautical balloons, covered with a frame of half-inch rebar and a coat of sprayed cement. Rest Stop: It's the only highway rest stop on 280, just north of the Flintstones House. Above it on the hillside is a statue of Father Serra, who founded many of the Spanish missions in California. Golden Gate National Cemetery: The military cemetery on the right just north of the I-380 exit is the last resting place of more than 130,000 veterans. I-280 ends at San Francisco, putting you onto King Street near the baseball park. Exactly where you need to exit depends on your final destination. Use your favorite route planning tool ahead of time to figure that out. This way of getting to San Francisco from San Jose might best be described as the urban route. Rush hour in San Jose starts in mid-afternoon. Check traffic if you can before you get to the I-280 exit. During peak traffic hours, it may be faster. Moffett Field: The air base at Moffett Field was once home to the airship USS Macon. It was a rigid blimp-type airship built by the United States Navy as a "flying aircraft carrier" to take smaller aircraft to their destination. After only two years in service, the Macon crashed off the California coast. The big structure in the photo is its hangar. Its skin was removed because of asbestos inside. Locals say when it still had its outer shell, it was so big that it created its own rain clouds inside. NASA Ames Research Center: It's one of ten National Aeronautics and Space Administration (NASA) facilities. Among its many facilities is the world's largest wind tunnel, which you may recognize because of its massive air intake doors. Side Trip to Stanford University (1 hour): Take exit #403 onto University Avenue and go west through downtown to see the campus. Shortly after you pass the Rengstorff Avenue exit, look on the right to get a glimpse of multi-colored bicycles and red outdoor umbrellas at the Google campus. It's It: Locals get excited just thinking about It’s It - but what is “it?” The item in question is a vanilla ice cream-filled, oatmeal cookie sandwich dipped in dark chocolate, a local favorite since the company opened in the 1920s. Their headquarters are near the San Francisco airport north of the Broadway exit. SFO (San Francisco International Airport): You'll get a glimpse of airplanes at their gates and may see one landing. SFO has two parallel runways, so don't be alarmed if it looks like two planes are trying to land at the same time. South San Francisco, the Industrial City: The hillside sign was created in the 1920s and is now listed on the National Register of Historic Places. The industrial description was true enough back then, when the town was full of factories and smokestacks. Today, the city's largest employer is biotech company Genentech. Cow Palace: It's not something you need to take a detour to see, but the name is puzzling enough to make you wonder what it might be. When it was built in 1941, it was called the California State Livestock Pavilion. People say it got its current name because of complaints about how much it cost to build, with someone saying "when people are starving why are they building a palace for cows?" Mount Diablo: On a clear day, look across the bay to see the top of Mount Diablo rising above the East Bay Hills. It's a mere 3,849 feet (1,173 m) tall but on a clear day, you can see as much as 200 miles in every direction from its peak. End of Your Trip: Where you should get off 101 depends on where you're going in the city. On busy days when traffic on 101 backs up, you may want to switch over to I-280 to get into town. East Coast vs. West Coast: Which is the Best Australian Road Trip? The Coulee Corridor National Scenic Byway: It's Amazing!